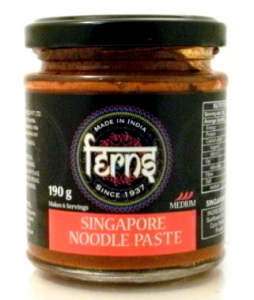 Ferns Singapore Noodle Paste Just Reduced. Delicious and easy to prepare this has bags of flavour and is great with thinly sliced chicken strips. Boil the noodles for 5 mins with 1 tbsp oil and a pinch of salt. While these are cooking heat the oil in a wok and then add the ginger, garlic, spring onions, carrots, peppers and shedded cabbage and stirfry for 1 min. Then stir in ferns singapore noodle paste and stir fry on a high heat for a couple of minutes. Once cooked add the soy sauce, tomato puree and a pinch of salt and serve. Also try with shrimp, shredded beef or diced chicken.